Don't know where else to go for real good Japanese food, especially fresh ones! Don't feel like visiting the usual sushi king or genki sushi! But then had enough of Jogoya and Saisaki... there's a new option in town and is located right smack in the city center! Yo!Sushi, one of the world's most innovative restaurants with over 39 locations in the UK and overseas serves unique, quality, fast and fun dining experience. Yo!Sushi not only bring Malaysians to a new fashionable luxury sushi culture with fresh innovative style and taste but also making a trend for it to be the new 'pasta' for this decade. Here's a teaser update of dinner at Yo!Sushi Pavilion - Kuala Lumpur together with Ian & Gary. Was suppose to go there with a few others such as Nicole, Kerwin, Jon... but oh well! We had GREAT food tonight! I've never eaten so much of raw fish before today! The dinner was great, will update the full update with great pictures of FOOD and all by tonight around 1am..!!! 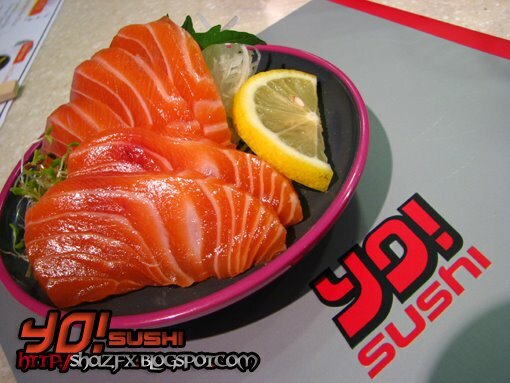 Yo!Sushi @ Pavilion - Kuala Lumpur, it's located on the lower ground floor (Level1). Yo!Sushi at Pavilion can seat approximately 80 - 100pax if i am not mistaken! And conveniently serve each and every customer with a unique dining experience! Salmon Sashimi...fresh new salmon airflown into the country today! You can not get anything better than this! Stay tuned tonight for the actual blog update about my trip to Yo!Sushi...and of course there's a 2nd update on Yo!Sushi dinner with Sandra 2 weeks ago...and many more! Stay tuned... Yo! Sushi rawksss...!!! Did you get jet lag when you eat it? Part 2 - Switchfoot surfin' the twin towers!